This movie is directed by Ridley Scott. Sound familiar? Though his filmography is long, my favorites are "Alien" and "Bladerunner". So why "Black Rain"? Because you have probably never heard of it. At more than 20 years old it's easy to let a mediocre crime story like this slip through the cracks. That said, Scott's visual stamp is all over this moody mafia noir. Especially if you like rainy city streets and 80s neon, this movie is filled with gorgeous material. So hover your index finger on over the PrintScreen button, and let's get watching. Exposure and use of value. Since this movie is set primarily in dark spaces, "Black Rain" keeps the characters draped in shadow. 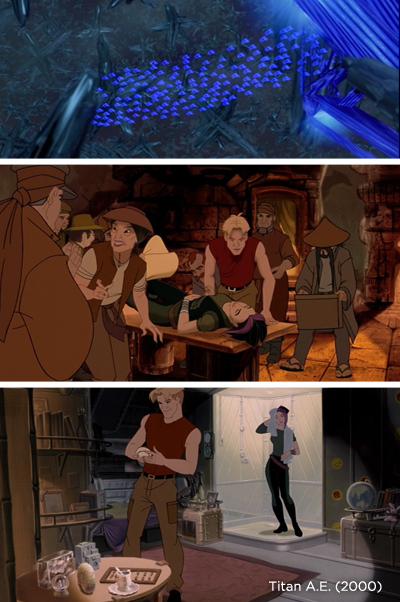 As you can see in the screenshots (right) it's common for a light fixture to dominate the characters themselves, making the scenes moody and vague. Rim lighting, reflective puddles, and neon glow are used as striking elements of 2D pattern. Some movies use very high key lighting to show off the actors and expressions - this movie uses low key lighting to add punch to the mood. Beautiful Locations. Set primarily in Japan, every set in this movie is jam packed with details. Night clubs, a metal smelting factory, modernist apartments - each and every set matters. Make sure to pause often in order to examine the set dressing, it's great stuff. Use the inspiration. Consider some of the techniques from the film studies series, and learn from this movie. Mood boards, composition sketches, color palettes... put "Black Rain" to good use! I almost always leave the movie theater feeling inspired to create, but my schedule stops me from sitting down to paint. If you're able, plan in some extra time directly after watching to sit down and draw or paint. Have fun!